It was a good plan. 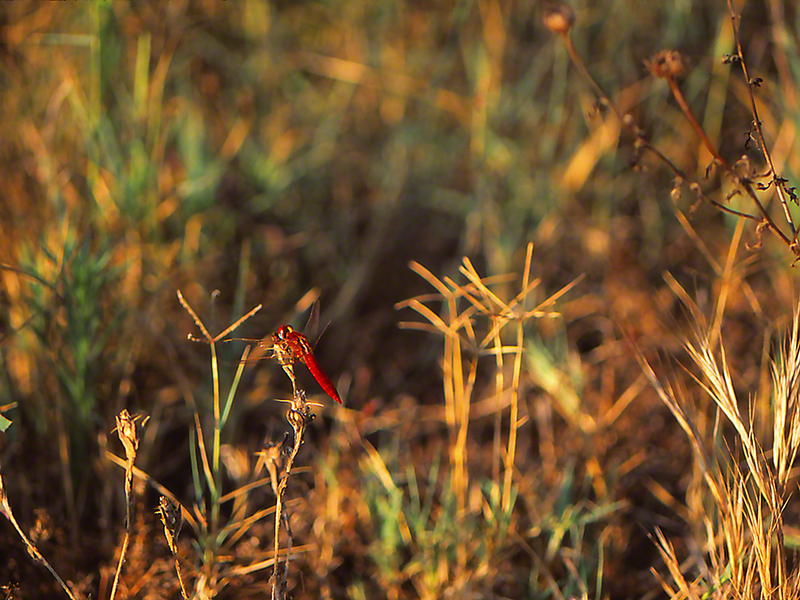 Arrive at the Mishmarot meadow at 6:30 A.M., just in time to find different butterflies sun-bathing, here and there. Those July 2014 mornings were beautiful, but, by 9:30 A.M., this American boy would begin to be wiped out by the heat of the Israeli sun. The plan worked well, but had to be flexible, because, you see, this certain darner kept guard at this certain spot. Friends here know that I enjoy red. This handsome insect was red’s red. Darners I have posted here get very good traffic, so, darner, red’s red. I decided to included it in my work. Not so fast. It was classically unapproachable. Twelve feet away, Goodbye! Day after day, the 12-Foot rule again and again. Sometimes it was away, hunting? Then it was back, but, no relaxing its 12-foot policy. Here is the best of my images. As soon as our Israeli friends jump in, we will know its name. For now, the Elusive Red.